In forex trading, the more trading tools you have the more effective trader you will be. 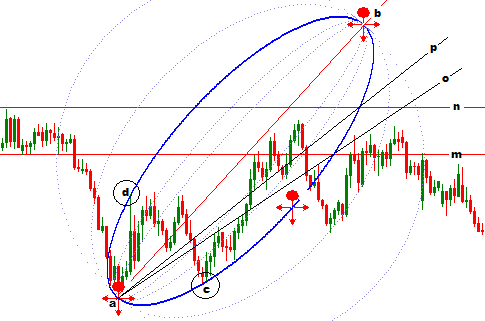 Fibonacci Ellipse, which is to be explained in this post, is a technical analysis tool which is very rarely applied by the traders. The reason behind that is not its ineffectiveness, rather very few traders are introduced with it. Most probably, a big number of traders are not introduced with fibonacci ellipse because it cannot be easily drawn on the popular trading platforms. But no reason to be worried, Fibonacci Lines Analyzer lets you draw the fibonacci ellipse very easily on any trading platform. When I first introduced with this technical analysis tool, the first challenge that I faced is to draw the tool on the trading platform. When this problem was solved, I faced challenges in interpreting the tool. Very few books and articles are written on fibonacci ellipse. If you read through the articles on Internet, most probably you will see a little value of the fibonacci ellipse technical analysis tool. I was introduced with the indicator about a year ago, and I understood its value just three months ago. I learned a lesson that no tool should be neglected, trying it once. After a long term application of the tool, I found it very effective in technical analysis. Let me explain how the fibonacci ellipse is drawn and applied in trading. To draw a fibonacci ellipse, we need three waves a, b, c as the three waves of corrective phase. Simply, we need three points a, b and c. Point 'a' is the starting point of fibonacci ellipse, which is the starting point of wave- a also. Point 'c' is the ending point of wave-b or beginning point of wave-c, 'b' point is the ending point of fibonacci ellipse. Point 'e' is the ending point of wave a, which may not be used to draw the ellipse in some special cases. However, to draw the fibonacci ellipse on price chart, place the starting point of the ellipse on the top of the wave-a. Then change the width and height of the ellipse so that the side of the ellipse touch the c and e points. Remember, we are drawing the ellipse when we only have a, c and in some cases e points. The b point is the ending point of the ellipse and generally remains beyond the price range. Now we will draw two vertical lines one is across the mid point of cb and another is across the mid point of db. You can find these points just averaging the price levels at c,b and d points. Next we will draw three trend lines such as ab,o and p trend lines. The o and p trend lines will be drawn across the points where the m and n vertical lines intersect the side line of ellipse. In a bearish market a fibonacci ellipse can be drawn as in the illustration below. Here we have only two trend lines because the c and a points are on a horizontal straight line. According to the traders' opinion, a fibonacci ellipse is not a tool to find the entry and exit signals rather a tool that explains the market patterns. It also a tool to identify the trend reversal. Following are the key principles traders should consider when applying fibonacci ellipse. The angle and size of the ellipse has to be considered. If the ab trend line is broken, it indicates a strong bullish or bearish trend. Generally, the ab trend line is not expected to be broken. m and n trend lines breakouts indicate possible break outs of the ellipse's side line. The horizontal lines represent support and resistance levels. The ending point of a ellipse is a strong support or resistance level, though it is rarely reached by the market. 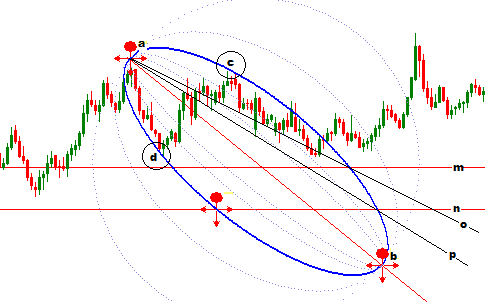 The dot-dot lines inside and outside the solid line of the ellipse can also be considered in trading. The above technique of trading with fibonacci ellipse is not 100% accurate technique in all situations, but it can still be useful in finding the reversals. In my next posts I am going to explain more about trading with fibonacci ellipse. If you have any question regarding fibonacci ellipse, just drop it below. I will surely answer your questions within 24 hours. Forex trading is the great platform to earn maximum profit. You can increase your capital if you make use of some effective trading strategies while trading. But having sharp trading skills is very important to become a successful trader.